Develop and implement the Units of Inquiry with a collaborative team to ensure an integrated curriculum. Provide inquiry based learning centres to build a solid literacy and numeracy foundation for students. Implement differentiated teaching, learning, and assessment methods to suit individual student needs. Utilize formative assessments to inform planning and teaching. Use action research to inform teaching and learning within the classroom. This is linked to professional goals, practices and development. Cultivate parent involvement in learning opportunities through weekly communication. Keep parents informed of progress through Back to School Night event, 3 way conferences, Open House events, student portfolios and end of semester reports. As part of the school's Enrichment programme, co-lead a Scrap Booking Club, Arts and Crafts Club and a Fitness Club. Implemented WIDA assessment to gain information about students’ language development and to inform on planning and teaching. Participated in Grade 3 planning meetings, and worked collaboratively with grade 3 teachers. Co-developed learning plans with classroom teachers to support specific students. With the collaboration of classroom teachers, implemented strategies for students in the process of exiting the ELL programme. Kept parents informed on entry, progress and exit of ELL programme. Grade 5 PYP exhibition student mentor, 2013 - 2015. As part of the CIS / NEASC accreditation process, collaborated with colleagues on the English Committee to put together a self-study of The KAUST School K-12. This included rating, analysing and providing evidence to show level of alignment. Using Jostens Yearbook Avenue publishers, designed the KAUST School Yearbook 2012/13 and 2013/14 for Grade 1 to 5. This included collaborating with classroom and single-subject teachers to photograph events, organise pages, and to personalise the design of the yearbook. Lead weekly morning meetings with Grade 3 - Grade 5 students to prepare for the week and decide on a PYP Goal of the Week. Assisted students in preparing daily morning announcements, including Goal of the Week, UOI updates and lunch menus. Used the IPC program to achieve UK National Curriculum outcomes. Worked closely with Learning Support Unit to provide differentiated learning outcomes and activities for English Language Learners and students needing extra support. Assessed students to National Curriculum standards and kept school wide records of student progress. Kept parents informed of progress during goal setting conferences, parents evening and termly reports. Assessed and placed ESL students on arrival at the school. Liaised with teachers to link specific areas the National Curriculum and IPC units to the ESL programme. Led a Guided Reading and Phonics presentation to Lower School Teaching Assistants. Involved in the school Book Week activities, including judging, creating and presenting certificates for the KS1 and KS2 handwriting competition. Took part in the after school clubs programme offering activities such as paper crafts, puzzle making and Sudoku clubs for children in KS1. Taught classes from Pre-School to Year 5 as a cover teacher, including 10 weeks as a Year 1 classroom teacher (October to December 2010). Assessed, placed and monitored students through the use of the IPT language assessment. Supported K3 classes during Language Arts using the Houghton Mifflin Language Arts Program. Proposed and implemented changes to ESOL support services. The new approach improved the amount of collaboration and communication between mainstream and ESOL teachers and enabled XIS to meet the PYP collaboration requirements. CIS accreditation and WASC (Western Association of Schools and Colleges) accreditation team member. Organized and led after school activities. I am a sociable person and enjoy making new friends from around the globe. I love dancing and Latin music, so became a Zumba instructor in the summer of 2015. It's a great way to work out and feel happy at the same time! I have to thank my mum for my dancing feet as she is from Peru and I spent some of my early twenties dancing with cousins in Lima and Arequipa. I am not bilingual but thanks to my visits to South America, Peru and Venezuela predominantly, I managed to gain a good command of Spanish and can hold my own in most situations. I love to sketch and paint and was recently inspired by visiting Tinga Tinga artists to carry on with this hobby. Something I try to share with my girls as often as I can. Over the past few weeks Grade 1LA have been inquiring into the responsibilities of community members at KAUST, amongst other important safety issues. Many of us wondered why children had to wear helmets when riding a bike, but not adults. We had some great discussions about bike safety but a couple of statements made us wonder even more about this KAUST rule. Hmmm, what could I do to help them understand that really, everybody should be wearing a bike helmet? Luckily, we had our very own bike expert, the wonderful Mr Dwane Harris, who knew firsthand how necessary it is to wear a bike helmet. 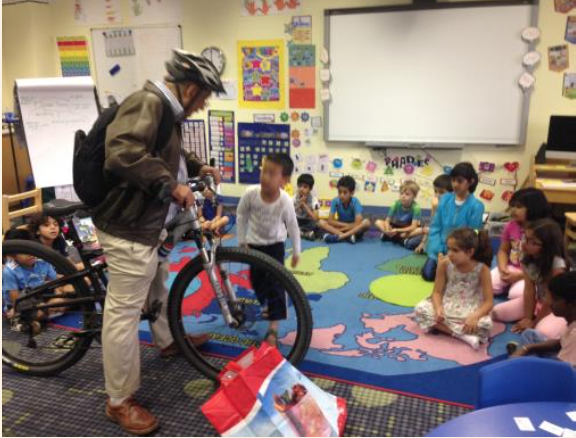 He captivated the class’s attention with the amazing story of how wearing a bike helmet had saved his life – he even brought in his trusty bike, Gary, his very dented bike helmet and the back brace he had to use for six months! If you still need convincing that everybody should be wearing a bike helmet, come and speak to the members of Grade1LA. They will have great advice for you! 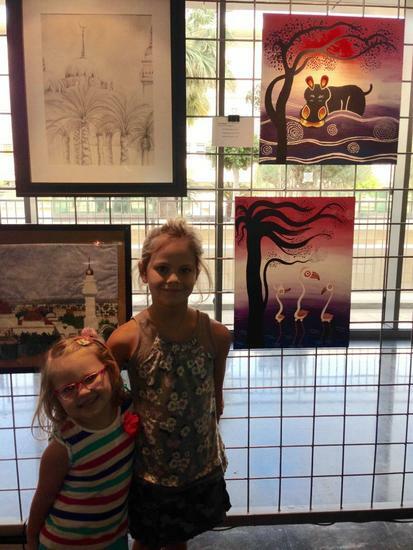 My daughters, Amelie and Evie, with our artwork at the KAUST Art Exhibition 2015.